* The Nielsen Company conducted 14,000 surveys evaluating 238 brands, 412 products, and 951 ad executions, and discovered that online video ads are more effective than TV ads with U.S. viewers. Ads that appear within streamed TV shows online could receive more attention because the audience is usually more attentive to their monitor than to their television screens during viewing. The study also found that TV ads repurposed for online use outperformed videos created specifically for digital use. * Facebook is running into some strong criticisms with the launch of its new social web tools. Part of the launch is the “Connected Profiles” option, which links a user’s current city, alma mater, favorite books, movies, etc., to Facebook Pages. Any unlinked information will be removed, which means users who opt out entirely will have a completely blank profile. This leads to privacy concerns, too. As Sarah Perez at ReadWriteWeb reminds us, a Facebook user’s list of Pages is public information — which means you can no longer hide certain information on your profile, unless you eliminate it altogether. 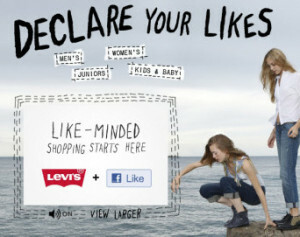 Screen capture of Levis.com used under Fair Use: Reporting.